I took these pictures before the tree topper was up, so don't look there ok. I figured I should just post them before Christmas is over already, it's coming up so fast! I did'nt have the energy with all the wedding planning I've been doing to think about going nuts- so with the DIY paper garland and a few extra tree branches my mantle was dressed up for the holiday in no time. I hope everyone is having a wonderful Christmas season so far! oh i LOVE what u did - looks FANTASTIC!!!!!!!! so pretty! the pics are great. I miss my fireplace! I love your mantel. It is the perfect amount of festive! what a great fireplace scenario you have going on. 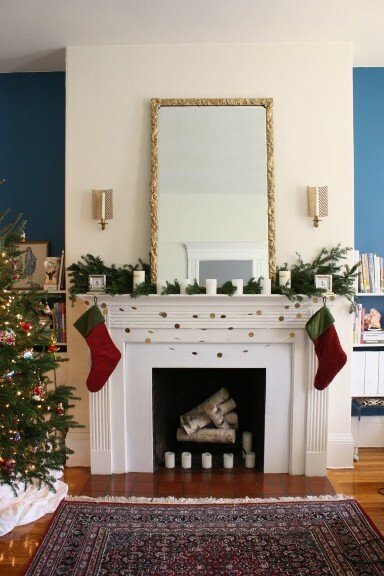 Love that you can put a tall mirror on the mantel and still love your handmade garland. beautiful! I love those sconces - I remember my mom had them when I was little (but your gold paint job was a great way to update them!). I think they were a home interiors item. Love it all! looks "done" to me! perfectly simple and festive! you have done an amazing job, LOVE it! I love your gardland -- it's simple and lovely! Love it!! Looks great! Do I spy a lucite stool w/leopard print fabric? Yummy!!! I cannot wait to see what your mantle looks like after you are Mr.& Mrs! Love your tree! Looks so great! And those SCONCES! Love them so much. 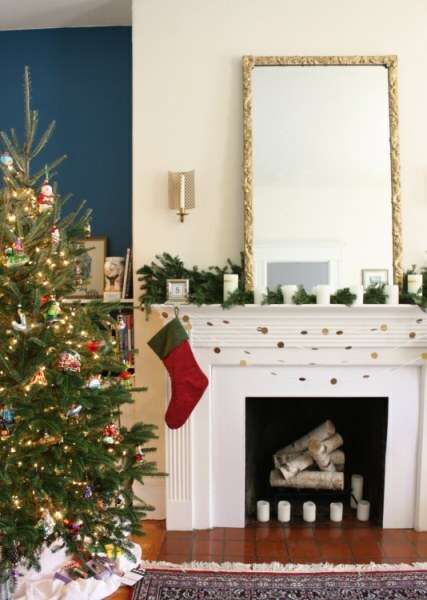 I'm loving the little garland across the fireplace. 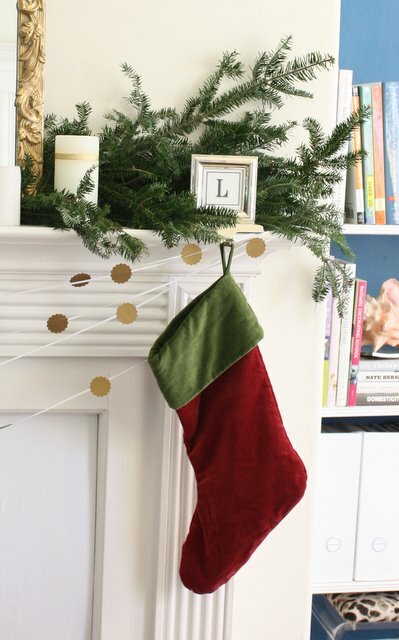 Very festive, I wish I had a mantle so bad every time I see a cutely decorated one! So pretty, your doing great what with dealing with the wedding plans too! Your place looks great! Love the shade of blue on the wall. everything looks gorgeous even the tree without the topper... congrats! This mirror works for all the seasons, doesn't it?! Love the logs in the fireplace...looking festive! I have to ask - what kind of camera do you use? Your photos are always wonderful!